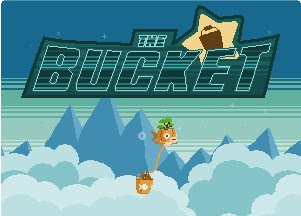 The Bucket is another new point and click game developed by nitrome about a flying mystical fish whose task is to get his raccoon friend to safety while munching randomly hanging fruits and stuffs in the air and making sure that raccoon does not fall and gets devoured by the scrolling left screen of death. Just like other nitrome games, this one offers nice and fun gameplay experience complimented with the old nitromish graphics and background music we all love and adore. Anyways, TB levels can be difficult at one way or another so it is a good thing that The Bucket walkthrough for some of its levels went live online (we hope to find the ones covering the rest of the levels).